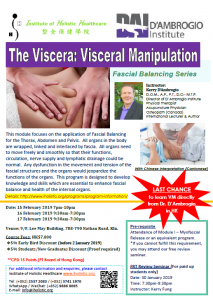 This module focuses on the application of Fascial Balancing for the Thorax, Abdomen and Pelvis. All organs in the body are wrapped, linked and interlaced by fascia. All organs need to move freely and smoothly so that their functions, circulation, nerve supply and lymphatic drainage could be normal. Any dysfunction in the movement and tension of the fascial structures and the organs would jeopardize the functions of the organs. This program is designed to develop knowledge and skills which are essential to enhance fascial balance and health of the internal organs. D.O.M., A.P., P.T., D.O.- M.T.P. Attendance of Module I – Myofascial Release or an equivalent program. *If you cannot fulfill this requirement, you may attend our free review seminar. Venue: 9/F, Lee May Building, 788-790 Nathan Road, Kln.